Room 6W is a big, square, single-story Chacoan room in the southwest sector of Salmon Pueblo. Later during the San Juan period, a kiva (6A) was built into the room. The Chacoan room measures 6.2 x 5.8 m and was the central living room for the room suite including Rooms 3, 4, and 7. The room had a doorway in its west wall that provided access into Room 4W. Twelve stratigraphic units were identified during excavation of 6W including a structured trash deposit, a floor contact surface on top of a decayed floor, and a number of feature-specific deposits. No roof-fall layer was found, probably because the room was converted into a kiva (6A) by the later occupants. 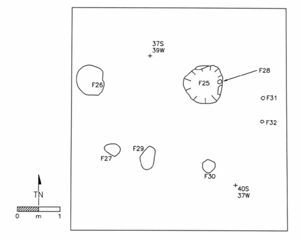 Nine features were identified in the room including the west wall doorway, three hearths, several postholes, a storage pit, and a trash pit. The room's location (plaza facing), its large size, and the hearth and storage features all indicate a predominant living or habitation function. The room was built by the Chacoans during the initial construction of Salmon Pueblo from 1090 to 1094 and was used until the end of the Chacoan period, around 1125.